The next time you’re in the market for a new good friend, I’ve got a suggestion: shop around for someone who grows his own asparagus. Or her own asparagus. Gender’s not the point. The point, if I may state the obvious, is that asparagus friends are worth their weight in, well, asparagus. While the rest of the world cringes and shells out exorbitant sums for a handful of the precious spears, friends of asparagus growers – or FOAGs, as they’re called – are awash in more fat stalks than they know what to do with. And the best tasting ones money can’t buy. As problems go, this is one of the better ones to have. I’m lucky enough to have a couple of good asparagus friends in my brother-in-law Dean and my sister Joanne. They may be family, but – here’s a tip – it still pays to grease the wheels of asparagus reciprocity with tokens throughout the year. Wedges of pie, cheesecake, cookies and quiche all work particularly well. For maximum return, time the bulk of your own generosity in the run up to asparagus season. 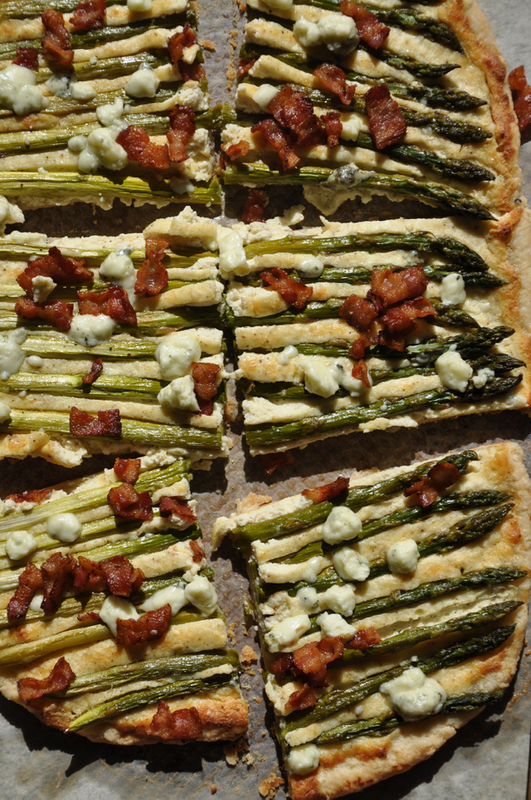 No matter how you come by your asparagus, let my introduce you to a wonderful showcase for your spears, Asparagus Tart with Bacon and Blue Cheese. 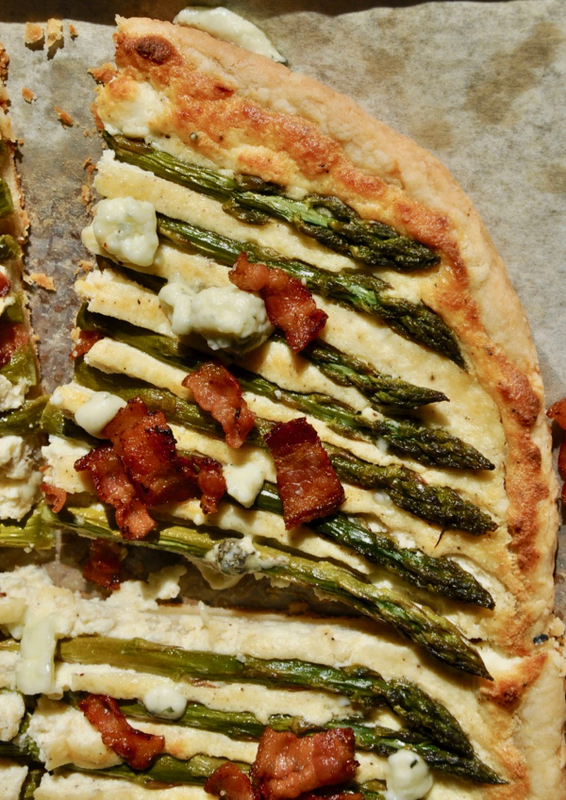 Maybe you’ve seen a lot of your basic cheese and asparagus tarts online and in the mags; I certainly have. Not to sound all snooty or anything, but most of these tarts are made with frozen puff pastry. That’s no sin, but you and I are scratch cooks and we like to show off our own crust whenever we can, correct? Since we’re showing off anyway, we go all out and fry some bacon for garnish and soften our asparagus in the bacon fat so (a) it soaks up the smoky flavor and (b) doesn’t come out stringy and undercooked once the tart is baked. With all those good flavors happening here I probably don’t have to tell you how delicious this is. Do serve it warm, in larger slices for your main course, or cut into small, bite-size pieces as an appetizer. It goes great with something lean and crisp on the side, like sliced cucumbers and halved cherry tomatoes tossed in vinaigrette. Or a big, colorful summer salad with fresh greens. While we’re on the subject of stringy, you probably know that the bottom third or half of any asparagus spear is the stringiest part of the vegetable. The fatter the spear, the more stringy it’s likely to be. But did you know that you can minimize that stringiness by peeling the bottom half of the spear? Apparently that’s not common knowledge because a lot of cooks I talk to have never tried it. All you do is roll the asparagus on a cutting board while you whittle off the outer skin with a sharp vegetable peeler. It’s so simple that I decided to show you how it’s done in just 17 seconds, the length of the video here. I was also looking for an excuse to try out the video capabilities of my new iPhone 7, so you’re my guinea pig. Finally, if you’re a fan of savory tarts like this one, you should know that we make a number of them every year – from the crust up – at our Lowcountry Pie Getaway in Charleston, SC. If you’ve ever wanted to immerse yourself in pie making, sweet and savory, and really up your pie game along with some incredible kindred spirits, come join us at this year’s event, October 6th through 8th. You can read all about it here. A quick thanks to the dozens of you who have preordered a copy of The Harvest Baker, my forthcoming cookbook. We’re thrilled with your great support and enthusiasm. Apparently there are plenty of you out there who share my passion for incorporating fresh produce into as much of our baking as possible, from quick breads to cakes and everything in-between. The official launch date is June 27th, so we’re extending our special $3 for shipping deal up until then. In case you missed my previous post about The Harvest Baker, you can find it here. Get out a large, rimmed baking sheet and line it with parchment paper. You can handle the rolling a few different ways. I prefer to roll the dough right on the parchment paper and then lift it onto my sheet, then trim the paper as needed. If you prefer, you can roll the dough separately then transfer it to the lined sheet. Or, if you don't use parchment, you can simply roll the dough and transfer it to the unlined sheet. Your call. Roll the dough into a large oblong roughly 13-inches long by about 10- or 11-inches wide. It should be about 1/8-inch thick, give or take. Don't worry too much about the edges; they can be somewhat uneven and cracked since this is a rustic free-form tart. Transfer the rolled dough to your baking sheet and refrigerate. Heat the olive oil in a very large skillet over medium heat. Add the bacon and cook, stirring, until crisp. Remove with a slotted spoon and transfer to a plate. Leaving all of the fat in the pan, add the whole asparagus spears, spreading them out as much as possible. Cook for up to 5 minutes, gently maneuvering them so they all come in contact with the pan and begin to tenderize. Don't overcook, however. Transfer to a large plate with a slotted spatula and cool. Combine the ricotta cheese and Parmesan in a mixing bowl. Add the egg, salt and pepper to taste, and garlic. Stir well. Set aside. When the asparagus has cooled enough to handle, get out your rolled dough. Roll the edge slightly toward you, pinching it into an upstanding ridge, about 1/3-inch high, to contain the cheese. Spread the ricotta mixture evenly over the dough and within the pinched edge. Arrange the asparagus spears in a single row over the cheese. As you get toward the ends you may have to trim the spears a bit, so they fit without jutting over the edge. Press the spears slightly into the cheese to secure them, but don't bury them fully. Bake the tart on the middle rack for about 35 to 40 minutes, until the edge of the tart is golden brown. Slide out the tart, sprinkle it with the blue cheese and crumble the bacon over that. Bake the tart another 5 minutes, until the blue cheese starts to melt. Transfer the sheet to a cooling rack. Serves 6 to 8 as a main dish, and twice that many cut into small appetizer pieces.